Watching crash tests of newer cars can be a great way to learn about which car would be the safest for you or your family. It’s also an excuse to watch YouTube videos of expensive cars plowing into barriers at 40 mph without worrying about the occupants. It’s a win-win. You learn valuable safety information and you get to see some automotive destruction. For this test, the IIHS (Insurance Institute for Highway Safety), slammed a 2017 Alfa Romeo Giulia into a wall and called it science. 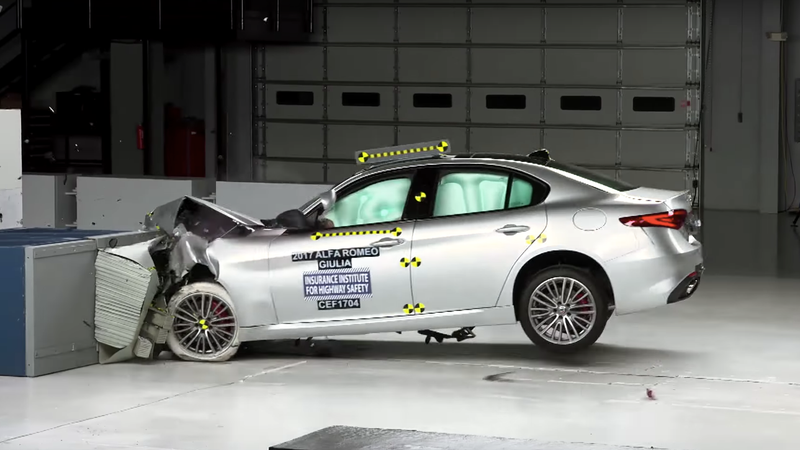 This trial was called the “moderate overlap test” and it tested the Giulia’s ability to protect its occupants in case of an accident. I’ve always wanted to know if I would be safe if I accidentally threw my Giulia into the corner of a 7-11 at 40 mph and the IIHS has answered my question. According to their test, the Giulia had a “Good” performance but I’m sure it won’t be driving again anytime soon with the front right side of the car shaved off. Crash tests are full of automotive schadenfreude. It’s a time-honored tradition to watch a car get obliterated in the name of safety. The IIHS channel on YouTube is full of crash test videos and can be found here. Alfa Romeo Technically Did Well In The U.S.